This website is all about human evolution and so takes its names from one of the most succinct quotes on the subject. But was the professor right to assure us of evolution’s validity? That’s the deep idea behind this week’s reader question. It comes from Don, who wants to know about the evidence for evolution. Of all the experiments which have been listed as being in support of evolution which two experiments do you think are the most important? This is a deep question that cuts to the core of modern biology. So it should come as no surprise that the answer comes with some caveats. The big one being me. I am a palaeoanthropologist. 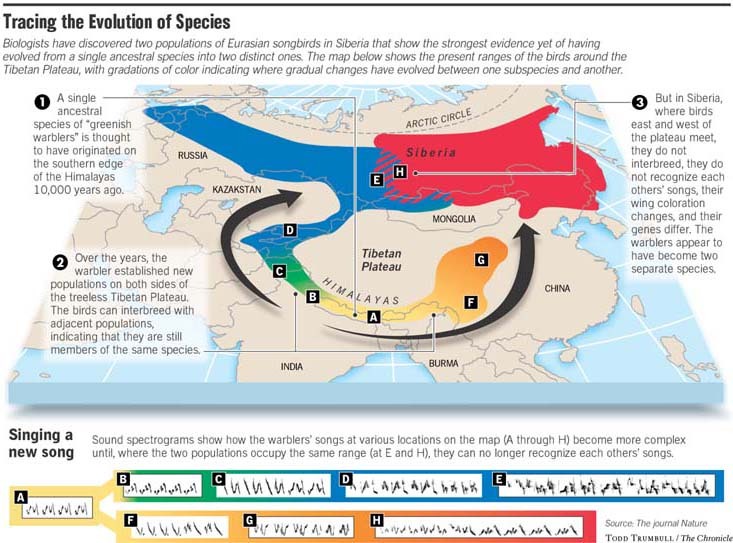 I investigate the evolution of humans and our closest relatives. As such I’m a step or two removed from people doing the sort of fundamental, basic research this question is asking about. So you may well get a much better answer from someone a bit closer to the source, as it were. However, without tooting my own horn too much I think I can give a pretty good answer also. The other main caveat is that this is a deep question that cuts to the core of modern biology. Like I said. So it’s intertwined with pretty much all biological research over the past 150 years. Each, in its own small way, has helped test and refine our understanding of evolution. Even basic stuff like where species are is wrapped up in evolution. Darwin, for example, used evolution to predict that the earliest human relatives would be found in Africa. However, many of his contemporaries thought those relatives would actually be found in Asia given our superficial similarities with orangutans. This disagreement wasn’t settled for nearly a hundred years until fossil in Africa were found. In other words, wherever you look you’ll find some ideas intertwined with evolution. So how to pick out just 2 to examine for this question? So I’m going to slightly diverge from the question asked. Rather than giving two best pieces of evidence, I’m going to give the best evidence from a couple of different areas. Hopefully, this will help capture the breadth of support for evolution in modern biology. Evolution takes place over generations. In most cases, this a timescale that cannot be studied in a lab. So if you’re looking for evidence for evolution, in most cases, you’re going to have to look at the real world. Fortunately, there are many cases where nature has done the experiments for us. Sometimes two species become naturally separated and will evolve independently. This allows to look back and study how evolution works. And, in the process, confirm that evolution is actually a thing. There are also times where we might accidentally help these natural experiments along. We will sometimes create a new environment for a species, forcing it do adapt relative to its “natural” cousins. Examples include the new species of mosquitoes that adapted to life in the London underground. The classic peppered moths would also fall into this category. 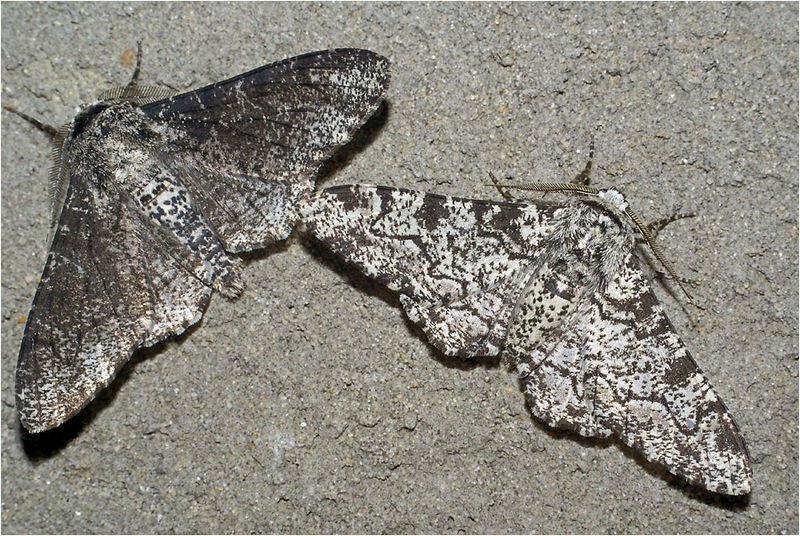 However, as iconic as the peppered moths are I don’t think they’re the best natural experiment of evolution. That honour goes to ring species. These occur when a species bumps up against a massive natural obstacle. As the species expands they gradually spread around this obstacle, they evolve. The result being the animals on the far side of the object are slightly different to the animals in the middle. And those in the middle are a bit different to those at the start. Essentially, it captures evolution in action. Except whilst most species change over time, these change over space. So we can watch it unfold geographically. There are many cases of ring species, but my personal favourite is the greenish warbler which spread around the Himalayas. Not only do they document evolution around the obstacle, but when the two branches met up again on the far side they’d evolved so much that they could no longer interbreed! They’d essentially become new species. Evidence for evolution and speciation in one nice example. For the most part, these natural experiments are where we’re going to find the most evidence for evolution. After all, they’ve been happening for millions of years. We’ve only been studying the subject since 1859. Nevertheless, there are few instances of rapidly reproducing species we can use to study evolution in the lab. These rapidly producing species can sometimes produce beautiful results, much like the elegance of the green warblers spreading. For instance, there’s a great time-lapse of bacteria spreading over an agar plate laced with increasing toxic substances. Their growth stops as they hit this “barrier”, before exploding again once a mutation helps them adapt. Even their movement over this plate looks like a phylogenetic tree. However, the best evidence from these experiments come from those which go on for a long time. Evolution is, after all, a thing which happens over time. 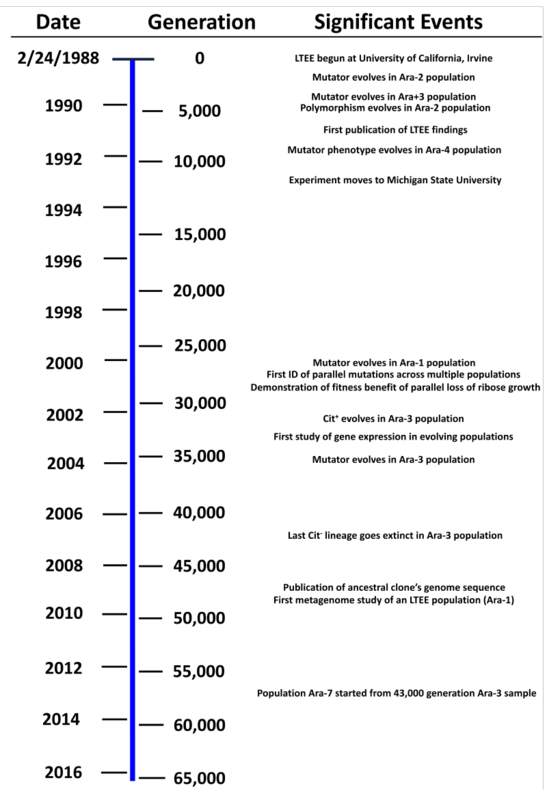 The longest of these is – fittingly titled – the long-term evolution experiment. It’s been going for more than 30 years and 50,000 generations of bacteria. During that time they’ve adapted, evolved, and changed right before the eyes of the researchers. Unfortunately, it’s been going on so long that there’s an awful lot of data. More than can be summarised in a cool gif like the image above. But some fascinating stuff has happened, so I’d still encourage anyone interested in going read about it. Cells have changed size, beneficial mutations have spread, deleterious ones have been fought. They even evolved to consume a new food source. I’m a palaeoanthropologist. And all the examples given are fairly unrelated to palaeoanthropology. As I said at the start, this is because I’m a few steps removed from this sort of fundamental research. But I also said in the beginning that there’s evidence for evolution everywhere. Including palaeoanthropology. So I’m going to be a little cheeky and give an extra piece of evidence. If I had to give the best piece of evidence from human evolution, it would be the agreement between the multiple lines of evidence. For instance, as fossils indicate increasing brain size, tools get more complex. As does behaviour. All the sorts of changes you’d expect to see as a species got bigger brains. And all independent lines of evidence, all agreeing on the same thing. And you see it over and over again. As species hands change, so do the tools they make. As their legs change, they travel further. Environmental changes are linked to local prey species changing, local plants changing, and bodies adapting to colder climates. However, much like the long-term evolution experiment, many of these don’t lend themselves well to visualisation. At least, not without me spending a few hours in photoshop to create some graphs. So I will leave you with one of the more occularly appealing pieces of information: the sheer scale of hominin evolution. As indicated by the literal trillions of artefacts we left behind. Or the literal dozens of ice ages we survived. Thank you so much for going to all this trouble. I am away on holidays so the time needed to fully digest some of the more complicated aspects of the reply means that it will be a little time before I can do justice to your answer. Trust you understand. How about the fossil record? My understanding is that many people were convinced of the process of evolution even before Darwin gave us the theoretical underpinning because the fossil record was so clear. Even Erasmus Darwin – Charles’ grandfather. Simpler fossils appear in older rocks, and there is a progression as the rocks get younger. Finding a rabbit in the pre-cambrian would blow the whole theory out of the water. Let’s not forget Lamark. He might have got the mechanism wrong, but he knew about change over time. You’re right that there were many rumblings about the idea helped along by the fossil record, which is a great piece of evidence. But I feel like it might be cheating to answer this question with hundreds of thousands of examples. Most people deny evolution due to their faith. However, Catholics and Jews don’t deny evolution. I mean, in theory, they shouldn’t. In reality (at least in America), about as many Catholics are creationists as accept evolution via natural selection. And here’s the other follow-up. I think that covers all the issues raised in your emails.